Rising interest rates, a nationwide inventory shortage and buyers out in full force this spring market—this is the current real estate climate most agents are doing business in. Even with market challenges, agents also have to compete with each other, especially when it comes to open houses. 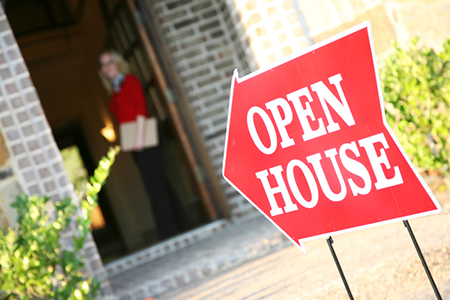 Here are some ways agents can create a competitive edge by increasing open house visibility and attendance to convert more leads and sell faster. First and foremost, hosting open houses regularly every week will allow agents to become a household name within their community. Not only that, but constant face-to-face exposure to the general public will help them sell their listing faster, as open houses tend to be well attended this time of year. According to the National Association of REALTORS® (NAR) Profile of Home Buyers and Sellers, in 2015, 48 percent of buyers used an open house as a source in their home search process. On top of the traditional Sunday open houses, agents looking to stand out can also host on Saturdays—and for extended hours on both days. Of course, attendance will be minimal without the correct approach to online marketing. Most buyers are beginning their search on the internet, and if an open house is not widely distributed throughout the most popular home search and social media sites—Zillow, Trulia, realtor.com®, Homes.com, Facebook, Instagram, etc.—chances are, agents will not meet as many viable leads at the open house. According to the 2017 NAR Profile of Home Buyer and Sellers, 51 percent of buyers find their home via the internet. Open house visibility should be augmented across the board, not just on the internet. Agents often can increase attendance—and, therefore, reduce time on the market—by promoting the open house thoroughly within the community itself. Setting up various open house signs throughout the neighborhood, especially on the corners of busy intersections, will not only attract buyers who are going to nearby open houses, but will bring in neighbors who may be looking to downsize or move up within the community, or may know of someone who wants to move into that specific neighborhood. The goal of an open house is not only to sell the listing, but also to obtain buyer clients if they are not interested in purchasing that specific property. In order to pursue them as leads, agents will need to collect valid contact information. Today's modern age is setting expectations for swift technological advancement within the real estate industry, and buyers will more likely be impressed with an e-sign-in process via tablet rather than a paper form. With clients who may not have much experience with technology, this is an opportunity to assist them while also developing the relationship with them as a buyer lead. The No. 1 priority should be memorability. Adding incentives, such as a free vacation or an entry to a raffle, will make agents stand out from other open houses in the area. Doing this also increases their chances of obtaining valid contact information, which is essential to securing the lead as a future client. When it comes to food and drink, agents are divided. Some believe it is an added touch that buyers respond well to, while others say it introduces risk because of allergies; however, open houses typically run through lunch, and visitors will undoubtedly appreciate refreshments while they drive house to house for a few hours without pause. Baked goods do well with sweet-tooth visitors and children, and will also neutralize any odors if baked on-site. Themed food and drinks that relate to the current season or an approaching holiday are also a great way to engage visitors. To reduce liability, agents can offer a list of allergens before providing visitors with refreshments. If the home has a fireplace, agents can light it on cold and dreary days. This will warm up buyers and ensure they are relaxed when looking at the property. Additionally, adding light, relaxing music will help buyers feel at home. Agents should also ensure all lights are turned on and shades are pulled up to let sunlight in; this will open up rooms and make the home appear larger. Lastly, and most importantly, agents need to prove they are knowledgeable about the market. Being able to provide pertinent neighborhood information—not only for their listing, but for those in the surrounding area within similar price points—will set them up as a community expert. Prospective buyers will also relate to the experience better, feeling as though they are receiving assistance rather than being pushed for business. According to REALTOR® Magazine, a broker in Denver, Colo., has had success in providing a giveaway map of the surrounding open houses for each Sunday. Agents can also now rely on technology to obtain relevant information for potential buyers. There are various apps available for providing home valuations, neighborhood data and more. In addition, having a smart home speaker such as an Amazon Echo or Google Home on hand may help agents access this type of information hands-free, providing the opportunity for supplementary flyers, added eye contact, longer conversations and a solid lead by the end of the visit.